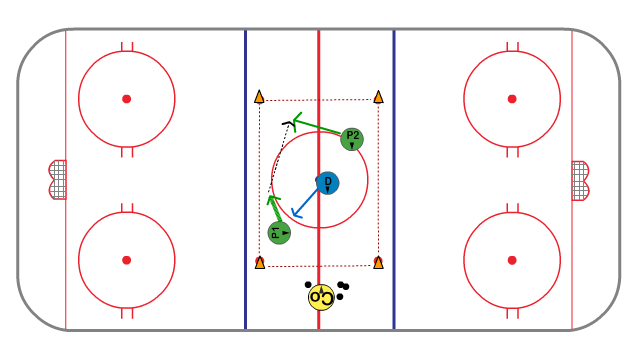 This small area game that focuses on passing and moving without the puck. It appears to be simple but go ahead and give it a try with some elite level players and you will see them struggle, it is not nearly as easy as it looks. Place a cone on each of the neutral zone face-off dots to mark the boundary. Two offensive players and one defensive player will be inside the playing area with the coach just outside the box with pucks. On the whistle, the coach will play a puck to the offensive players who will move throughout the playing area making as many passes as they can. The defender will try to break up the play and intercept passes and if they get the puck they can just shoot it out of the box. It the puck goes outside the box the coach plays a new puck to the offensive players right away. As players make completed passes the coach will count out loud each time a successful pass is made. The offensive players try to make 7 consecutive passes (or 5 consecutive passes for lower age groups). If you have a net and a goaltender, let forwards attack the net after 7 passes have been made. Goalies can work on tracking the puck with shuffles, t-pushes, and slides. The key is for players to pass and move. There will be a tendency for players to pass and watch but this cannot happen in a small area. Remind players without the puck they have to help their partner by giving them a good target, moving and always being ready for a pass. Defensive players should have active sticks, stop and start, and skate in straight lines.